In an unusual publishing experiment, debut author J.Y. 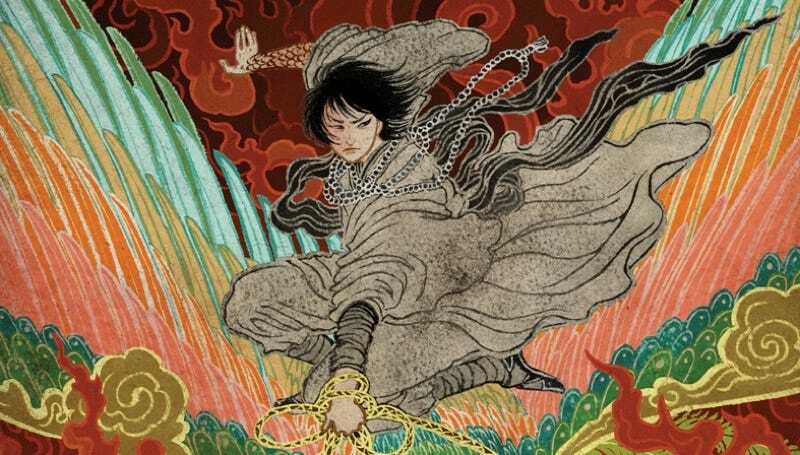 Yang is releasing two “silkpunk” fantasy novellas on the same day: The Red Threads of Fortune and The Black Tides of Heaven. The books aren’t out until September, but holy crap are the covers by illustrator Yuko Shimizu amazing. In fact, they’re so unbelievable we had to show them to you—and then talk with Yang about the stories inside. io9: In 2015, we asked author Ken Liu to explain “silkpunk” to us. Does his definition hold true for you? J.Y. Yang: Great question! To be honest I missed Ken’s interviews the first time around, so I wasn’t really aware what of what “silkpunk” entailed until quite recently. I think the world I’ve created definitely fits in the aesthetic, since Ken and I are drawing from similar cultural sources for our background worldbuilding. I didn’t focus on historical veracity as much I as I did on trying to envision what technology might look like with the science/magic system I devised [where] people, with the right kind of training—like a martial art— can learn to manipulate five different sorts of fundamental energies: gravitational, kinetic, thermal, electromagnetic, and biochemical (corresponding to what I called five natures of the Slack: earth, water, fire, metal, and forest). The dominant society, for example, has fairly advanced biotechnology. I thought that, given the right sort of tools, there’d be much more progress on learning to fix the human body than say, building a better semiconductor, something which would bring less immediate benefit than maybe being able to regrow a whole liver from a small sample of tissue. That kind of thing. I also wanted a society where there’s an uneven penetration of technology, which is similar to what you see in the world today. So you have segments of society where they have access to ansibles and nuclear weapons, and segments of society where they still rely on horse-drawn carts. And these two things can co-exist. Is being a Chinese-Singaporean writer what drew you into the genre? Yang: I’m not convinced it follows that being Chinese-Singaporean would automatically draw people to write the kind of things I do! More to the point, I didn’t start out with the idea of writing into a specific genre either. I wanted to write something that was absolutely indulgent, full of the things that would make me happy both as a reader and a writer. So I did. My touchstones for these novellas are a lot less esoteric than people would think! I’ve described them to friends as “Dragon Age meets Jurassic World meets Star Wars meets Mad Max,” and I stand by that description. That’s quite the description! So who are some of your favorite authors and biggest influences? So what are The Red Threads of Fortune and The Black Tides of Heaven actually about? Yang: I’m glad you asked! The books center around a pair of twins, Sanao Mokoya and Sanao Akeha [who are] children of the Protector, the supreme leader of the dominant empire in this setting. They were given away to the Grand Monastery as a blood price, and then taken back when it turned out that Mokoya is a prophet, a very rare talent. Black Tides is told from Akeha’s perspective and starts when the twins are born, and it follows Akeha’s struggles to deal with his twin’s powers. He eventually abandons his family and becomes an outlaw, then joins the Machinist movement which opposes his mother’s rule, and has to make some difficult choices between his family and the growing rebellion. There’s a bunch of murder, messing with gender, and also boys kissing. Red Threads follows Mokoya and takes place after the events in Black Tides. By this time she’s pretty broken: she’s running from tragedy, she’s lost her powers of prophecy, and she’s recovering from a terrible accident that has left her scarred and given her a replacement lizard arm (which is honestly the least broken part of her). So the logical thing to do, obviously, is to hunt down giant, winged naga with a bunch of raptors. At the start of the book she’s tracking down one of these creatures, that’s suspected to have sent from the capital to destroy a city that’s become a Machinist base. She meets this mysterious, alluring person named Rider and starts to find out that things are not as they seem. So the two novellas are pretty different. One is a family drama that spans over three decades, and one is an action film that covers about two and a half days in the life of Sanao Mokoya. Why did you decide to write them as two novellas rather than combining them into one story? Yang: It wasn’t an active decision, so to speak. What happened was, I wrote Red Threads first, [and] it was stand-alone. I wanted to write fun action-adventure that had things that I wanted to see in secondary-world fantasy: queer romance, Asian characters, difficult women. So I had this story, and there was its protagonist, Mokoya. I was pretty clear about her background, her family history, her relationship with her twin brother. And as I was thinking of the bigger picture, of what I wanted to do with this world I’d created, I knew that one of the stories I eventually wanted to tell was that of her brother Akeha’s. The story of how they grew up, and how he grew up in the shadow of his gifted twin. I thought it would make a good follow-up novella, coming after the first one. In my pitch letter to Tor.com Publishing for Red Threads, I causally mentioned that I had more stories to tell in this universe. Because that’s what you do, you tell them that they’re investing in something that has the potential to be more than stand-alone. Right? So after they’d made the offer on that one novella, my brilliant agent DongWon said, “Did you mention you had another novella idea? Do up a synopsis and we’ll pitch it as a two-book deal.” So I summed up the yet-untitled, yet-unwritten novella number two in a paragraph, sent it over, and Tor.com Publishing was keen. That’s how it became two books. Both of them separate, but to be published at once. A twin launch for twin characters. Is there an order people should read them in? Yang: I don’t want to dictate which order people read them in! I feel like they’re quite different books which set out to do quite different things. I’m also interested to see if people’s reactions to each book differ depending on which they read first. For example, one morning while my editor Carl was reading Black Tides, I woke to six caps-lock Twitter DMs from him yelling “WHAT?? NO!! YES! !” at something had transpired between two characters. And I wonder if his reaction would have been as, uh, intense if he wasn’t already familiar with these characters from Red Threads. Likewise, I think some parts of Red Threads would feel more significant if you read Black Tides first and you knew the backstory. So, yeah. I want to run this like an experiment on reader reactions depending on which book they read first! The novellas serve as the beginning of your Tensorate Series. What can you tell us about that? Yang: Well, I think a lot of that depends on how well these books do! But I definitely have two more novellas knocking around in my head, and at least one novel. There’s actually a lot of stuff in the novellas that I put in to lay down foundations for the novel I have in my head. Whether or not these things see the light of day—well, my characters have the powers of prophecy, I don’t. The books’ covers by Yuko Shimizu are so, so gorgeous. Did you have input into the design? The novellas come out September 26, 2017. How can readers keep up with you in the meantime? Yang: I have a newsletter, “Irregular Circles,” which you can sign up for to keep up with any updates, articles, and the like. It’s fun, and you get free fiction, too! My website is where I blog about the art of writing; you can also follow me (@halleluyang) and my publisher (@TorDotComPub) on Twitter.